We often speak of emptiness as a bad thing but sometime “empty” is good. That is the case of the empty tomb! Many of us re-tell the resurrection story around Easter time. I thought I would share my favourite teaching tool for telling the Easter story. And, yes, it involves plastic eggs. I did not come up with this teaching idea but I have to say I’ve used it over and over through the years. Kids love it and teachers find it very easy to use. I published a blog post about it in 2012 but I think it is worth posting again. Collect 12 plastic eggs and a used egg carton to store them in. Note that you don’t have to use plastic eggs if they are not available. You can use 12 sacks or boxes or just cover the items with 12 cloths or paper. Use a permanent marker to number the eggs from one to twelve. Collect representative items (listed below) and put them inside the eggs. Place the eggs inside the egg carton. Introduce the story by asking the children how they would feel if they went on an Easter egg hunt and every egg they found was empty. Lead into the lesson by saying sometimes it is GOOD if an egg is empty. Sometimes an empty egg is the best egg of all. Open the egg carton and begin the lesson by opening egg number one. As you open the eggs one at a time you re-tell the story to the children. You might let them guess what each of the items might represent. After you tell the story distribute the eggs to the children and let them take turns re-telling the story. If you are able and have fewer children then you might help the children make one of these sets each to take home. As I said, this idea is not new with me. I’ve listed some sites I have seen that explain some other variations. Many teachers are making plans to tell the resurrection story on Easter Sunday. Whether at Easter or any other time here are some ideas that will help you share what is the most important event in the Bible. Learn about the Burial and Resurrection of Jesus so you will understand the story and feel comfortable sharing it with a child. Visit a mature older Christian and ask them to share why the Resurrection is important to them. Place a dark cloth over a small table to form a “tomb”. Ask someone to be the body inside. Place a cardboard rock at the entrance. Let the children see the body inside and then put the stone in place. “The body” crawls out the back and the children remove the stone to see an empty tomb. Young ones love this obvious re-enactment. After telling about the Resurrection guide a child in praying thanks to God. Use these instructions for The Story of the Cross to learn a simple way to tell the story using one sheet of paper. Ask younger children to draw the story of the resurrection. Make use of plastic eggs on sale at Easter time. Use these instructions for “Resurrection Eggs” to re-tell the story of the resurrection. 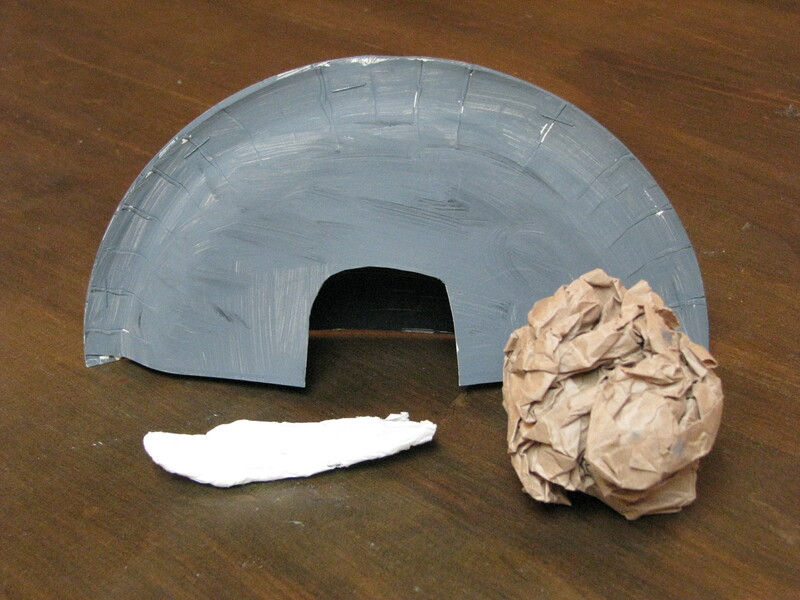 Make a tomb craft from a paper plate. Cut a paper plate in half, paint if desired, and then staple the top rims together. To make the body of Christ cut a simple body shape from cardboard, wrap with one layer of toilet paper and dampen with water from a spray bottle, repeat layers and let dry. The stone is just crumpled brown paper. In one class we had the children each make a tomb and then put the body inside. During the week I moved the stones and removed the bodies. The next week we were going to be studying about the resurrection. When the children arrived that day they immediately went to the tombs they had made and were shocked to find the body missing. I let them search and conjecture for awhile before leading into the story of how the women came to the tomb to find Jesus’ body missing. The children could totally relate to how the women must have felt. At the end of class I returned the “bodies” so that the children could take the craft home and recreate the event for their families. Write the individual words of Romans 6:9 on a whiteboard or chalkboard. Say the verse together. Erase one word or phrase and say the verse again. Say it over and over, eliminating one word or phrase each time. Soon, the children will have it memorised. Write the individual words of Romans 6:9 on pieces of paper and then mix them up. Children can unscramble the verse to and memorise it. Print and use a colouring page or puzzle from one of these online resources. Before, during, and after your teaching, be sure to praise God for the resurrection of Jesus! When was the last time you were curious about something? I mean really curious; the kind of curiosity that compelled you to get off the couch, or out of the office to go and earnestly seek out the answer; the burning desire to “know” that enticed you to look around the corner or walk down the untravelled path. How energising is that quest! How thrilling and satisfying is the answer once found! I never want to deny a child the chance to feel that energy, thrill and satisfaction. In my rush to GIVE information I must first allow children an opportunity to actually WANT it. God draws children to himself through their curiosity. I love how he prepares the Israelites leaving Egypt for future questions their children will ask. Notice he says “when” your son asks you and not “if” your son asks you. God knows children will be curious. God does not want us to feel the satisfaction before we have answers because he is the answer. Only God can satisfy the curiosity and longing children (and adults) feel. The Bible is filled with interesting and attention-grabbing stories that children can easily relate to. Before sharing a Bible story I will often share one small part of it as a “teaser”. Here’s a fun and effective activity to try next time you teach children. Keep Them Guessing is a simple activity where children are provided with items as clues to guess what comes next. A stone before you share about the burial and resurrection of Jesus and the stone rolled in front of the tomb.